Needless to say, the songs of the sixties are my favourite full-time hobby. Well, it all started when I first began to chase the stories behind The Beatles’ songs. Then there were The Herman’s Hermits, Gerry and The Pacemakers, The Merseybeats, The Beach Boys, The Shirelles and many others’ songs… on repeat when the nights were young. Nothing makes me happier than to meet passionate people, talking, reading or writing about the swinging sixties. Brian L. Forsythe is definitely one of them. The best stories compiled are to be found in his newly-launched book – “Inside the Songs of the Sixties”. I’m always eager to find fancy stories, beautiful truths, hidden facts, small meaningful details and, why not, even lost secrets as the years passed by. I tried different websites or books, but, by now, Brian Forsythe’s book is the best I found – complex, comprehensive and authentic. Some were facts that I already knew, but many of them were very nice surprises. I truly recommend it to all sixties enthusiasts, as it is a never-ending source of stories – stories of artists, bands, songs, albums, concerts. And many other facts ready to be discovered page by page. The anthology includes everything that needs to be known about the golden years of the ‘60s music. The sixties did change the world. The sixties filled the world with colour, vivid rhythm, brilliant tunes. 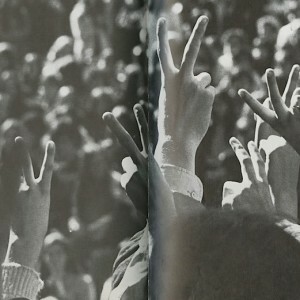 The sixties gave the world Woodstock, rainbows of songs and happiness. “Inside the Songs of the Sixties” fully captures all this joy of life and joy of singing. During Christmas of 1966, Elvis was driving home to Memphis when “Green Green Grass of Home” came on the car radio. He couldn’t stop raving about the song and got a friend to call the radio station and have them play it repeatedly. Believe it or not, The Cascades’ “Rhythm of the Rain” was the 9th most played song of the 20th century. “This Diamond Ring”, my favourite of Gary Lewis and The Playboys, was first rejected by Bobby Vee. Roy Orbison offered his tune “Only The Lonely” to Elvis Presley and The Everly Brothers, but was rejected by both. Each of The Beatles were paid $60 for their work on the LP “Please Please Me”. The guitar intro for The Searchers’ “Needles and Pins” was the result of an engineer accidentally leaving on the echo switch while recording. Hi Diana. Thank you for your very kind words. Glad you enjoyed the book. My inspiration came from the lack of books on this subject that are available on the market as well as my love for sixties music. Exactly, there is a lack of books on the market on this topic. Therefore, it’s excellent for us, the oldies fans, that you succeeded in compiling everything into a lovely book.